How to research the history, development, architecture, collections and management of the State Library of Victoria. The forecourt spans the full width of the block from Little Lonsdale Street to La Trobe Street. Since the Library opened in 1856, the forecourt has been altered a number of times, not without public outcry. Joseph Reed's original design of a fountain with mermaids spouting water into a pool was not realized. The first Library trustees fenced off the land around the Library and it remained closed until the redesign of the site in late 1938. The bronze lions were installed in the 1860s. In 1873 cast iron gates were installed. During the mid 1870s the planting of the forecourt was re-planned. Gasoliers were installed in the forecourt either side of Sir Redmond Barry in 1891, by F. G. W. Richard, a metal worker. The alterations in 1939 included the diagonal flights of steps, wing walls and edging, the terracing of the lawn and the formal plantings of lilly pillies and melaleuca styphelioides to a design by Public Works Department architect, Percy Everett. The forecourt underwent another refurbishment in 1998. For information about the statues in the forecourt, see Statues and murals. The Age, 29 April 1997, ‘The dirt on the library lawn', Metro section, p.C3. Family History & Newspaper Room - on microfilm. Copy also held in Local History File entitled ‘Melbourne (Vic.) Libraries. State Library of Victoria. Forecourt'. The City of Melbourne is working with the State Library to develop a design to improve the appearance of the forecourt bounded by Swanston, La Trobe and Little Lonsdale Streets. Includes photograph. The Age, 30 April 1997, ‘Rolling out the green carpet', p.A20. Family History & Newspaper Room - on microfilm. Copy also held in Local History File entitled ‘Melbourne (Vic.) Libraries. State Library of Victoria. Forecourt'. The Age, 2 May 1997, ‘Unanswered questions', p.A14. Family History & Newspaper Room - on microfilm. Copy also held in Local History File entitled ‘Melbourne (Vic.) Libraries. State Library of Victoria. Forecourt'. The Age, 6 May 1997, ‘Going back to the future? ', p.A14. The Age, 5 December 1997, ‘Will the future leave history on the shelf? ', Metro section, p.C3. Article looks at the proposed changes to the Library including the forecourt and reading rooms. Includes photograph of forecourt under renewal and plans. States that new trees planted to replace those that have been removed will be Angophora costata and Celtis australis. The Herald-Sun, 20 September 1997, ‘Library courts a new future', p.4. Local History File - ask at La Trobe Information Centre desk. Includes copies of newspaper articles, illustrations and other material relating to the 1997 redevelopment of the forecourt of the State Library of Victoria. Allom, Lovell, Sanderson, Pty, Ltd, 1985, State Library and Museum of Victoria buildings: conservation analysis. Melbourne, Allom, Lovell, Sanderson, pp 52-55. History of the forecourt, from Reed's 1853 unrealized design of a romanticized fountain with mermaids spouting water into a pool, to changes in 1865, 1873, 1876 and 1939. The Herald, 2 September 1938, ‘New National Gallery entrance', p.1. 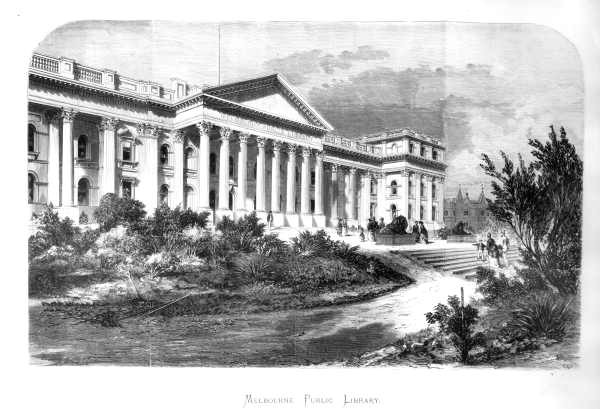 Reproduction of a perspective drawing by the Chief architect of the Public Works Department, Percy Everett, showing the proposed design for the main entrance to the National Gallery and Public Library. Shows what the forecourt will look like once the ₤5000 approved by the State Cabinet last night for beautification and improvement has been spent. Available online to 1954 via Trove. Redmond Barry, the Library's founder, had his own familial coat of arms placed on the exterior wall of the Library, beneath the portico, directly above the main entry on Swanston Street. 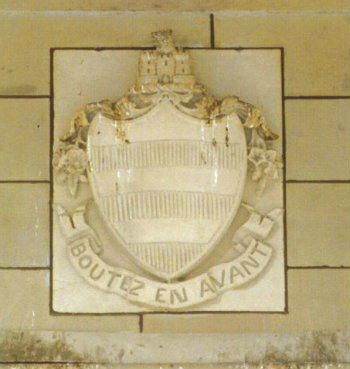 His family motto is 'Boutez en avant' ('Thrust forward'). 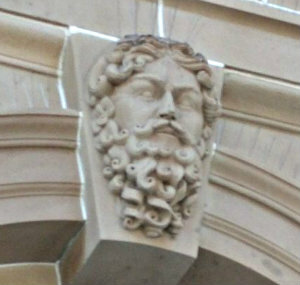 Above the doors at both the Russell Street and Swanston Street entrances are images of human faces. This style of ornamentation is a mascaron. Generally it doesn't depict an actual person but is decorative. The mascaron at the Swanston Street entrance is visible in the earliest photos of the Library, prior to the portico being constructed. Such features can be seen on many 19th century Melbourne buildings.